Grilling is what summer is all about. 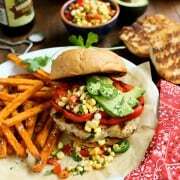 You’re going to love these super flavorful Grilled Tex Mex Chicken Burgers with Fresh Hot-Pepper Corn Relish! 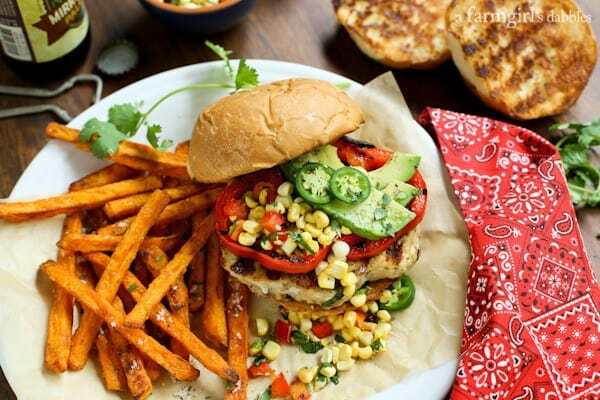 Grilled Tex Mex Chicken Burgers with Fresh Hot-Pepper Corn Relish. These chicken burgers are awesome good! Herby Grilled Chicken Kebabs with Grapes and Shallots – A little bit casual, a little bit fancy, these kebabs are super tasty and so pretty. Have you ever grilled grapes? If not, you must give this recipe a try! Grilled Honey Sriracha Chicken Burgers with Cilantro Cream and Pickled Onions – These chicken burgers, grilled with a simple glazing of a honey and sriracha mixture, make my family happy at meal time. Spiced Maple Chicken Burgers with Sweet Potato and Apple Hash – Topped with an egg and served with sweet and savory hash, this is the ultimate breakfast burger. Italian Chicken Sausage Soup with White Beans – A bowl of warm, flavorful comfort, that’s what this soup is! Gold’n Plump chicken is produced by GNP Company, which is based out of St. Cloud, Minnesota, about 90 miles northwest of where we live, right along the way we travel back to South Dakota and North Dakota to visit our families. The frozen chicken patties weigh 1/3 lb. each, the perfect size for a regular bun. And they’re vacuum-sealed and packaged very neatly, six to a box. Each patty is separated by a piece of parchment paper, making it easy to grab just one or two for a small meal. And they can go straight from the freezer to the grill or skillet without thawing first; an awesome convenience for busy families and last-minute dinner plans. My family has enjoyed each of the Gold’n Plump flavors of chicken patties, but we all agree that this latest Tex Mex flavor is our favorite. 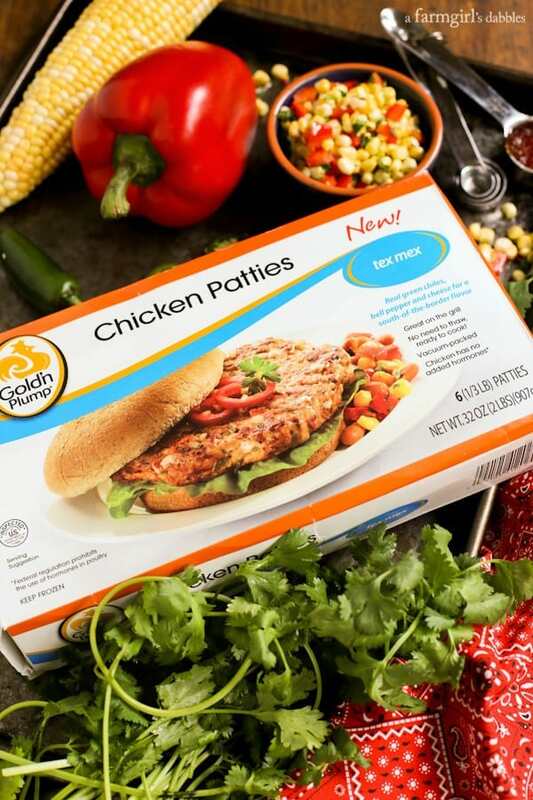 The chicken patties are flavorful with hot pepper cheese, diced green chiles, a hint of jalapeño, and Tex Mex seasonings. The grill is utilized for three different pieces of this recipe. First, butter the buns and set them on the hot grill grates or stovetop grill pan to toast them and grab a bit of char. Char = flavor. Then grill slices of fresh red bell pepper, followed by the Tex Mex chicken patties themselves. If you want to take this recipe one step further, top the chicken burgers with slices of good, melty cheese a minute or two before taking the chicken burgers off the grill. This will add another layer of flavor and texture. Once the grilled chicken burgers are placed on the buns, snazzy them up with an easy-to-make fresh hot-pepper corn relish. If you’ve never eaten raw sweet corn kernels, please give this quick relish a try. I love to incorporate raw sweet corn into my salads all summer long. The finishing touches to these grilled Tex Mex chicken burgers are slices of fresh avocado (or use your favorite guacamole) for a luscious creaminess, plus thinly sliced fresh jalapeño for an added kick. With each bite, you get a variety of incredible textures and flavors. 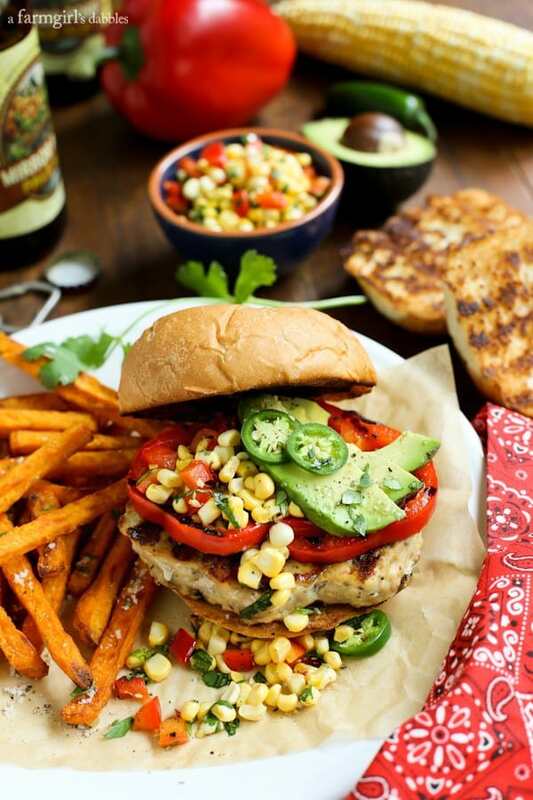 When you make these Tex Mex chicken burgers, be prepared for them to be devoured…fast! In a medium bowl, stir together the raw corn kernels, red bell pepper, and hot pepper jelly. Then stir in the cilantro. Taste, adding kosher salt and freshly ground black pepper as needed. Set aside. In a bowl, drizzle olive oil over red bell pepper rings, tossing gently to coat. Place pepper rings on hot grill. Once the pepper rings have charred a bit, after a minute or two on the grill, flip them over to char the second side. Remove to a plate. If your grill is large enough, grill the buttered buns alongside the red pepper rings. If not, grill them next, with buttered sides on the grill grates. When the buns have charred to your liking, remove them to a plate. Now turn up the heat just a bit more, to high heat. 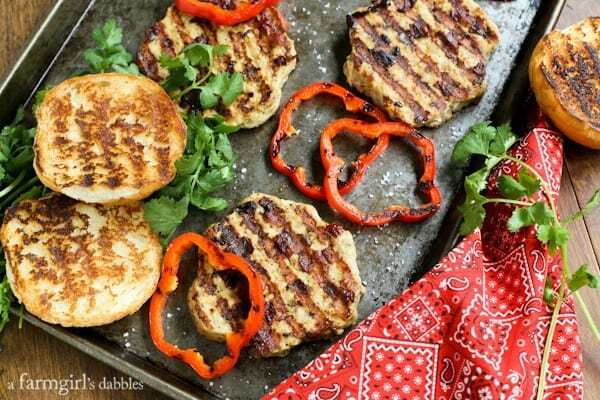 Place the chicken burgers, directly from the freezer, onto cleaned and oiled grill grates. Grill for 4 to 5 minutes. Flip chicken burgers over and grill for another 4 to 5 minutes. Remove chicken burgers to a plate. If adding cheese slices, place the cheese on the burgers 1 to 2 minutes before removing them from the grill. To assemble the grilled Tex Mex chicken burgers, place a grilled chicken patty on top of a grilled bun bottom. Top with a ring or two of grilled red bell pepper, followed by a big spoonful of fresh hot-pepper corn relish. Add slices of fresh avocado, plus fresh jalapeño slices. Finish with a sprinkle of kosher salt and freshly ground black pepper, if desired. Top with grilled bun top. Assemble the remaining chicken burgers and then enjoy! This post is sponsored by Gold’n Plump, a chicken brand based out of St. Cloud, Minnesota. I am partnering with them again this year to bring you delicious new chicken recipes from our kitchen and backyard grills. All opinions are 100% my own, as always. Thank you for supporting the brands that help make this site possible!